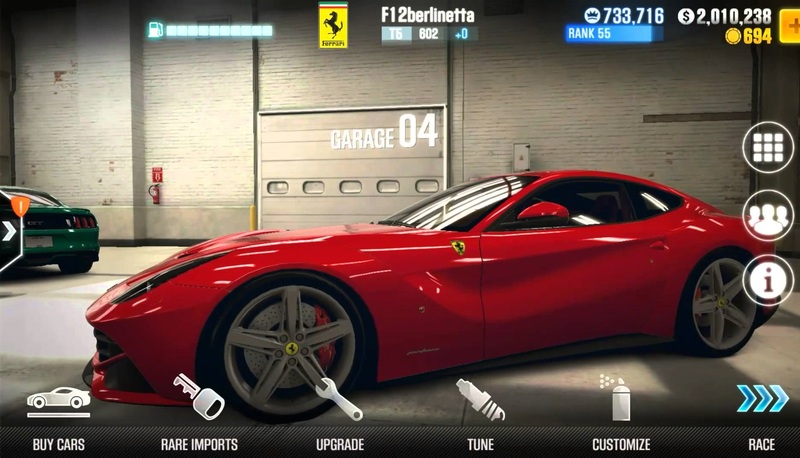 In this guide for CSR Racing 2 we want to give beginners (and maybe some experienced players) some tips that you may not have known. Like most new players, we found that guides and information to be scattered and to be difficult to completely understand at our level. We’ve summarized what we’ve found for your convenience with the goal in mind of min / max’ing CSR Racing 2 for the end-game. We will also answer the question, if there are cheats in CSR Racing 2 or not. As you probably know there are 7 (8 if you count fusions slots.) upgrades that can be made to your car in CSR Racing 2. Like most drag racing games you can upgrade all of these up to stage six. Fusion Parts have three “stages”, uncommon, rare, and epic. An observation that we have made regarding upgrades is that turbo, engine, transmission, and nitrous increase your PP a tad bit more than intake, body, and fusion parts. Tires however are a bit of an oddball. If your car is putting down a lot of power and not a lot of grip and resulting in wheel spin, tires are definitely a great choice, but if you are completing runs with little to no wheel spin, they tend not to decrease race times as well as if you were encountering those problems. Stage 6 parts tend to be hard to come by, and even harder to find for your own vehicle, don’t worry as time progresses and you begin to collect more cars, as well as fusion parts you will be bound to find at least one matching part. These ultra-rare parts usually tend to give a decent increase in performance, and when used in conjunction with a good tune and fusion parts, give your car the potential to be unstoppable. Natural Motion has really created a unique tuning system in the way that there is no one tune that will make a maxed car perform to it’s max potential, this is thanks to the addition of stage six and fusion parts, which (obviously) alter the way your car drives, so that you must change your tune accordingly. With that being said, you can be thankful for the fact that they made tuning also very easy in CSR Racing 2. When first taking a look at tuning, it all looks very confusing. Is it better to have a quick but super powerful shot of nitrous? Or maybe a very long, low power shot? Do we want grip or acceleration? Do we need to run a dyno test every time we change the tune? Gear ratios? Luckily for you we asked these questions long before that global launch of CSR Racing 2, so we know most of the answers. We could provide an in-depth look at what all these do and how they would affect your car, but to avoid confusion, we’re going to tell you the simple secret to tuning. Your evo points. When you make even a minute change in your tuning, your evo points will either go up, down, or remain the same (very rare). By the way your nitrous tune will not affect your transmission tune or you tire pressure tune, or vice versa. You can however, send your evo points into the negative by making one tune so horribly wrong, it cancels out the bonuses from your other tunes. We usually break down tuning into a process. First we tune our nitrous. In our experience it is always better to have a short, but concentrated shot of nitrous, in both 1/4 and 1/2 mile races. Then we move on to our transmission tune, each car is different here, some require a way higher or lower gear ratio for higher performance, and some, just need to be left alone for optimal performance. The best way to start tuning you transmission is to move it a little to the left of the set marker, see what happens, then move it a little to the right. Whichever direction gives you positive evo points is the direction that you want to be headed. Take larger increments to the direction until either; your evo points go up, but very slowly we’re talking one maybe two points, or your evo points begin falling slowly or quickly. Here is where it get’s a bit tricky, if your tune is going up very slowly than move it up in very small increments of .01 or .02 until you are at the greatest evo points you can get. Some car are very fickle in CSR Racing 2, for example our Hellcat didn’t want to give more than 40-50 evo points with stage 4 upgrades, but when we maxed her out, she gladly was tuned up to well over 500! Experiment with your car and sometimes, if you cant get a good tune, just wait to install some more upgrades and try again. Fusion parts in CSR Racing 2 are tricky little buggers. Sometimes they even make you evo tune go down? Give me as few days to run some tests and get some solid numbers so we can understand more about how they work and interact with your vehicle. Until then, here’s what we know. There are three different levels of rarity for fusion parts: Uncommon, Rare, and Epic. When you fit your car with fusion parts, they seem to have only a small effect on your evo tune and not on your car’s PP. Some It seems that the first few stages of upgrade can be fitted with mostly uncommon and sometimes rare parts. The later stages also seem to have mostly rare parts and few times epic. However on our maxed Mini there are no slots for epic parts, but in the inventory there is room for epic parts. Perhaps epic slots are more likely to appear on rarer cars? In our experience the ONLY epic slot we have seen is on KJ’s Toyota 86, on the stage 6 turbo slot. We have a theory that higher tier rare cars will yield far more epic slots than that of a lower tier, less rare car. Much is still unknown about how these parts work. For example also on our maxed mini, we have stage 5 transmission, which has 1 uncommon slot, but if I were to fit it with that part, it would actually REDUCE our Evo tune by 13 points. Like we said earlier, we still have more tests to run with fusion parts and some rare and some not rare BMW’s. Honestly, multiplayer in CSR Racing 2 has been broken during the soft launch, we assumed they would fix it for the global launch, but they didn’t. With that being said, this wouldn’t be a complete guide without it so here you go. Basically, you want to get your rpms to the right launch point as normal in CSR Racing 2. Second, you need to hit the launch control button within .7 of the countdown. If you get within .7 of 3-2-1-LAUNCH, it will give you a super start. We haven’t noticed much difference in our times with the super start, but we think it does help some. The main purpose of the launch control is really just to add another level of variables to the live races, making it more difficult to build a winning streak. Don’t ever buy super nitrous, it is always possible to win a boss car without it, however 9/10 time your car will need to have mostly stage 5 parts. You can get away with this, but we would recommend ALWAYS maxing out your car just to be sure. Also don’t make a mistake. MASTER your launch if you want to try and take a boss car. Do not win the final boss race if you are not ready to challenge them for your car, because you will not get the option to win the final race and come back for the Final-Final Race. Boss Cars are good for 2-3 races into the next tier and cannot be upgraded, so be ready to purchase another car after the boss car outlives it’s usefulness. Be wary of these discounts though, because the higher tier you are in, the more expensive they become. Let’s talk about cheats for CSR Racing 2. Many players are wondering if you can get to extra money or reputation by certain inputs. However, this is not possible, because there are In-app purchases at CSR Racing 2, with which you can buy benefits. Thus one gets gold for real money, with which you can then buy all sorts of things. There are hacks on the Internet even for CSR Racing 2s, that promise unlimited money and reputation. This we do not recommend, because often these are offered as an APK file, which then turn out to be virus or trojan and can cause much damage on your device. Thanks to user boquintana for help creating this guide for CSR Racing 2. 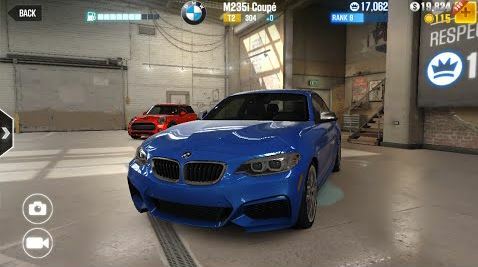 3 Comments on "Guide with Tips, Tricks and Cheats – CSR Racing 2"
Are we able to sell cars that we win or cars of a lower tier? Cars that we win from bosses are not sellable. And only if u have more than 1 car(again non-bosses cars) from each tier are you able to sell them. Hope that helps and happy racing. Only downloaded and playing this game 3 days ago. Good fun.